"Plasticity" is not about plastics. However, it is about what plastics in a sense can do. As used by architects, plasticity is a term used to describe a rich, three-dimensional or sculptural presence of a building. When the form of a building exhibits a sculptural presence, even if that may be strictly made up of straight lines and boxes, we say that it has plasticity. In engineering usage, the term plasticity refers to the likelihood of a material to permanently deform under a load. In a sense it is the opposite of elasticity. Translated into architectural-talk, a building with plasticity has deformed itself from a simple box into a more complex form because of the planned usage of the building or the pressures of the site or maybe just the will of the architect. Taken to an architectural extreme, plasticity becomes a kind of frenetic composition, with each building part screaming for attention, the whole lost in the confusion of the parts. One of the implicit or explicit desires of most architects is to bring each building into a balance between simplicity and plasticity. 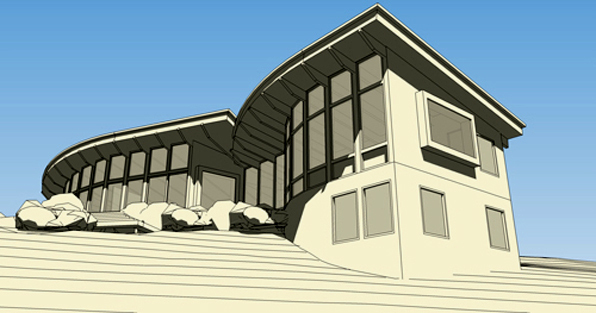 Architects often make models of their projects in perfectly clean white cardboard or render computer models in generic white materials. This is not necessarily a quest for purity or simplicity, but it allows the shadows casting on a building to more clearly demonstrate the level of plasticity of the building design.